With Easter just around the corner there are a lot of moms posting pictures on Instagram and Facebook of their Easter egg decorating adventures with their little ones. Mason was still a little young last year so we didn't do any decorating. So this year I’m extra excited to do something with him. I started doing some searching on some toddler friendly ways to decorate Easter eggs. I wanted something that wouldn't bore Mason, but I also didn't want his fingers to end up all sorts of colors from dyeing eggs. I found a several different fun decorating ideas. I’m not sure if we’ll use them all this weekend, but in case you haven’t done your Easter egg decorating here’s a couple ideas for you. The easiest egg decorating idea that requires no dye is stickers. Simply use small round stickers in different colors to create a pattern like a flower or keep it simple with a few big dots. Toddlers love stickers and you may even have some spare from reward charts, calenders or children’s comics. 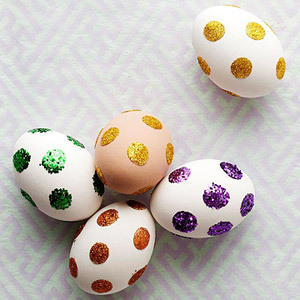 Polka dot glitter eggs are simple yet stunning! The eggs below in pretty polka dot blue and pink glitter are a great example. For young children you don’t have to be that neat. Just roll in glue or get ‘stick-happy’ with the glue stick and roll in glitter. Remember those pretend tattoo transfers when you were young? Well, they look great on eggs too. Just follow the instructions on the transfers. This uses the same resources as the sticker eggs, but this time you put the stickers on before you dye the eggs and peel the stickers off once the eggs are dry. Strong geometric shapes work best. Cut the double sided sticky tape into strips that are 0.5 cm thick and attach to your egg. Use separate bowls for different colors of glitter. Remove the backing from one strip of double sided sticky tape and firmly roll the egg in the darkest color of glitter. Gently remove the extra glitter. Then repeat for your next color of glitter. Here are some more in depth directions on a couple fun decorating ideas. Give your Easter eggs an eye-catching effect. Make glittery polka dots without the mess using glue dots and fine glitter. Make it: Rest the egg on bottle cap, then apply about 12 glue dots, about ½" apart. Pour glitter onto a small plate and press each glue dot into the glitter until completely covered. Repeat for each glue dot. When all of the dots are coated, use the paintbrush to wipe away any excess glitter. For an Easter decoration you can use year after year, have kids cut flowers from paper napkins and decoupage them onto ceramic eggs. Make it: Cut flowers or desired design from paper napkins. If using 2-ply napkins, peel away the thin white paper backing from the cutout napkin pieces (this will make it easier to glue to the egg). Use a foam brush to apply glue to half of the egg, then press a napkin flower on top and cover with a thin layer of glue. Add more napkin flowers, one by one, making sure to brush the top of each with glue. Place the half covered egg on the roll of tape and let dry for about 15 minutes, then repeat for the other half of the egg. When completely covered, set the egg on roll of tape and let it dry overnight. Happy decorating! 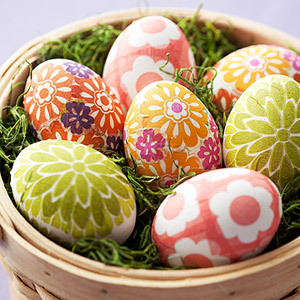 Feel free to posts pictures on our Facebook page of your Easter Egg decorating fun!